2.1 Locality 1 [NM 440 682]. 2.2 Locality 2 [NM 435 684]. 2.3 Locality 3 [NM 434 686]. 2.4 Locality 4 [NM 425 681]. 2.5 Locality 5 [NM 427 680]. 2.6 Locality 6 [NM 427 679 - NM 424 674]. 2.7 Locality 7 [NM 415 674]. 2.8 Locality 8 (NM 417 667]. 2.9 Locality 9 [NM 426 667]. 2.10 Locality 10 [NM 427 672]. 2.11 Locality 11 [NM 435 669]. 3.1 Locality 12 [NM 441 669]. 3.2 Locality 13 [NM 442 668]. 3.3 Locality 14 [NM 443 668]. 3.4 Locality 15 [NM 444 658]. 3.5 Locality 16 [NM 440 662]. 3.6 Locality 17 [NM 439 661]. 3.7 Locality 18 [NM 438 663]. 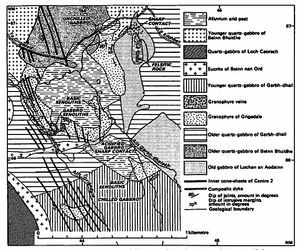 Geology of the shore section south of Eilean Carrach (based on Skelhom and Elwell 1966). Geology of the area east of Grigadale. Centre 2 (based on Pailhankar 1968). During the course of this excursion the plutonic intrusions of Centre 2 may be examined at the northern part of their outcrop, together with their relationships with the inner cone-sheet suite of Centre 2. Fluxion gabbro, the Great Eucrite of Centre 3, and the Beinn nan Ord eucrite, are visible at Portuairk, and the hypersthene-gabbro and granophyric quartz-dolerite between Eilean Carrach and Ardnamurchan Point. South of the road from Grigadale to Achosnich, the relationships between the Grigadale granophyre, the quartz-gabbro of Garbh-dhail and the older gabbro of Lochan an Aodainn are displayed. The best exposures of the granophyric quartz-dolerite, showing the effects of comagmatic acid and basic material, occur below high water mark near Eilean Carrach. This part of the excursion therefore requires a low tide. All other coastal localities, while best seen at low water, are accessible at most states of the tide. Total distance (Portuairk-Portuairk) about 15 km, some of which is by vehicle. From Kilchoan follow the Lighthouse road to Achosnich. Thence continue straight on for Portuairk, parking vehicles on the right of the road immediately before descending the steep hill into the village. Locality 1 [NM 440 682]. Gain access to the beach by following the stream down from the road bridge at the foot of the hill. The fluxion gabbro of Portuairk is well exposed along the coast, with its characteristic fluxion structure developed almost everywhere. Numerous bands of fine-grained rock are also present in the gabbro. An apparent contact of the fluxion gabbro with the Great Eucrite of Centre 3 occurs at high water mark at the head of a small sandy bay (due north of the Post Office), which is the mouth of the Allt Inbhir Luachair; but as the Great Eucrite in this area also shows fluxion structure it is difficult to distinguish the two. Near the Great Eucrite, vertical west-north-west joints are conspicuous in the fluxion gabbro. Acid veins containing angular and rounded blocks of fine-grained basic rock also occur. No clear contact with the eucrite of Beinn nan Ord is visible. Locality 2 [NM 435 684]. Following the coast westwards, the eucrite of Beinn nan Ord is exposed around the small headland north of the western end of the road at Portuairk. The rock here is an augite-rich variety, the augite forming large ophitic plates, essentially similar to the cognate xenoliths that occur in the allivalitic eucrite seen at locality 17. Olivine is fairly abundant, although acidified gabbro or eucrite also seems to be part of the intrusion. Xenolithic material in regular-running bands is prevalent. The eucrite is traversed by acid veins, the largest of which contains fragments of fine-grained basic rock. Locality 3 [NM 434 686]. Continue north-westwards, crossing a small rocky bay, for about 200 m along the coast, to another small headland. Continuous rock exposure in this area reveals a vague junction between the eucrite of Beinn nan Ord and quartz-gabbro of Loch Caorach. The relative age of these intrusions is not clear, although the two rocks are of contrasting type. The quartz-gabbro is a moderately coarse-grained rock containing pseudomorphs of olivine in magnetite and talc, which are associated with hypersthene. There is an abundant acid mesostasis. Locality 4 [NM 425 681]. From the headland return to the rocky bay, and thence climb westwards to the foot of the crags below the coast guard lookout station. Follow the crags westwards for about 200 m, crossing over the granophyric quartz-dolerite, until a marked north-south gully is reached. Turn south and follow the east side of the gully to its termination, and thence west, past a ruined croft, crossing hypersthene-gabbro, to the sandy beach which separates Eilean Carrach from the mainland (see coloured map). At the northern end of Eilean Carrach, mineralogical layering in the hypersthene-gabbro is seen to dip to the east at about 30°. Further south, on the island, xenolithic sheets in the hypersthene-gabbro also dip at about 30° to the east. Locality 5 [NM 427 680]. From the southern end of Eilean Carrach, cross the sandy beach to the east to the crags on the.mainland adjacent to the beach. At the southern end of these crags. a westerly dipping granophyre sheet is found cutting the hypersthene-gabbro. This is an outlying intrusion of the granophyric component of the granophyric quartz-dolerite. The gabbro above the sheet is riddled with acid veins to a distance of 3 m or more, and continuity between these and the main sheet can be clearly established. The granophyre sheet contains numerous basic xenoliths similar to those found at locality 6G (below). Less altered and more angular fragments of hypersthene-gabbro are also present. Cone-sheets are observed cutting the hypersthene­gabbro in this area. Locality 6 [NM 427 679 - NM 424 674]. On the mainland shore south of Eilean Carrach, the relationships between aphyric dolerite, porphyritic dolerite and granophyre, within the granophyric quartz-dolerite. and those between the granophyric quartz­dolerite and the hypersthene-gabbro. are very well displayed. Grid references for the various sub-localities are not given, their positions being shown in Figure 13. A. A steeply dipping contact between aphyric dolerite and hypersthene-gabbro is seen. B. Aphyric dolerite is exposed containing inclusions of hypersthene-gabbro. C. In this area the porphyritic dolerite in part overlies a complex association of aphyric dolerite and granophyre, but elsewhere their contact is steeply dipping, suggesting that the aphyric dolerite and granophyre complex consists of a series of sheeted intrusions, with frequent vertical linkage isolating lenticular bodies of the porphyritic dolerite host. D. A sheet of flat-lying granophyre containing few inclusions of basic rock cuts the porphyritic dolerite. The porphyritic dolerite shows a fine-grained margin only a few centimetres wide. E. Small-scale granophyric net-veining occurs in both aphyric and porphyritic dolerites and connects with large-scale sheets of granophyre containing a varied assemblage of basic inclusions. F. The granophyre contains large inclusions of aphyric dolerite. The aphyric dolerite inclusions show rounded, fine-grained margins in some parts, and angular, coarse­grained margins in others. G. Granophyric veins occur. isolating more or less rounded· masses of aphyric dolerite which range from a metre or so up to more than 10 m across. The granophyric material is crowded with angular inclusions of basic rock. While these angular inclusions are of uniform texture throughout. the larger, rounded masses show a fine grained margin which may extend to 1 m or more in width. with a zone about 0.3 mm wide of dense rock rich in iron oxide immediately against the contact. Within the fine-grained margins a faint banded structure is usually present, and in some places a parallel development of minute feldspathic veinlets is seen. H. Porphyritic dolerite is cut by sheets of granophyre in which inclusions of basic rock occur. Individual sheets are not very persistent. but dyke-like apophyses which link the sheets at different levels are numerous. The sheets are either flat-lying or have a gentle westerly dip. I. A steeply dipping contact between porphyritic dolerite and hypersthene-gabbro can be seen in this area. J. Porphyritic dolerite is here cut by granophyre. The dolerite does not have a fine-grained margin and the contact truncates the phenocrysts in the dolerite. Aphyric dolerite inclusions within the granophyre occasionally form contacts with the porphyritic dolerite and, in some places, joint-bounded blocks of porphyritic dolerite have subsided into the aphyric dolerite. K. In this general area the hypersthene-gabbro shows the development of a mineralogical layering, the layering dipping east at about 15°. Layered sections of the gabbro are separated both vertically and laterally by non-layered gabbro. Locality 7 [NM 415 674]. Pass through the caravan site east of Port na Carraidh, and thence along a track which joins the Lighthouse road by the bridge across the Alit Grigadale. Follow the road westwards to the Lighthouse at Ardnamurchan Point (the most westerly point on the British mainland). On the shore west of the Lighthouse is exposed the quartz-dolerite outer marginal facies of the hypersthene­gabbro. Eastwards the rock passes into quartz-gabbro, which here represents a rather acid facies of the hypersthene­gabbro. The rock is cut by steeply dipping porphyritic and non-porphyritic cone-sheets of Centre 2, and also by basic dykes. Locality 8 (NM 417 667]. Return south-east along the Lighthouse road until easy crossing of the Allt a Bhriaghlann is afforded. and thence south-west to the rocks north of a conspicuous area of wind-blown sand, forming the southern shore of the bay south of the Lighthouse (Bhriaghlann). At this point. away from the marginal facies of the hypersthene-gabbro, xenoliths of basic hornfels are seen dipping east at moderate angles. The gabbro texture is very variable and the xenoliths are sometimes surrounded by a coarse gabbro which is more feldspathic, and has less iron ore, than the normal facies. Locality 9 [NM 426 667]. Head east across country for about 700 m, passing two small cairns, to a point on the Alit a Bhriaghlann. about 300 m south of the road. where a wooden bridge allows access to a series of rocky outcrops. These show layering in the hypersthene-gabbro dipping east at about 25°. Locality 10 [NM 427 672]. Return across the wooden bridge and head north to regain the Lighthouse road. Continue east along the road to a point about 250 m beyond the bridge across the Allt Grigadale. The quartz-gabbro of Loch Caorach is exposed on the roadside. and about 100 m north of the road a contact with the granophyric quartz-dolerite is found. Close to this contact the quartz-gabbro becomes finer in texture. and is cut by veins of gabbro-aplite and augite-rich gabbro-pegmatite, which run parallel to the contact. At the contact the fine-grained gabbro becomes porphyritic and resembles the adjoining porphyritic dolerite. Locality 11 [NM 435 669]. Continue east along the Lighthouse road to an area about 300 m beyond Grigadale, where the younger quartz-gabbro of Beinn Bhuidhe is exposed in several roadside positions. Between these, a considerable variation in the degree of development of an acid mesostasis is present. In the most unaffected state the rock is a moderately coarse, ophitic dolerite, but the effect of the later acid migration brings about an albitization of the feldspars and a recrystallisation of the pyroxene. If proceeding directly to this section of the excursion from Kilchoan, vehicles may be parked on the left of the road about 100 m towards the Lighthouse from Achosnich. Lying mostly to the south of the Achosnich-Lighthouse road, the Grigadale granophyre presents a series of interesting relationships with the surrounding intrusions. These indicate that the quartz-gabbro of Garbh-dhail has been intruded in two phases, separated by the emplacement of the granophyre. 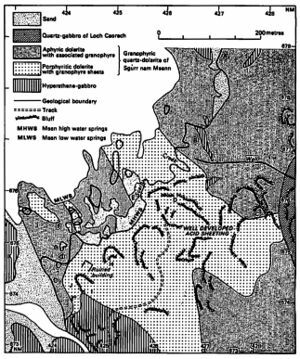 The geology of the area is shown in Figure 14. Locality 12 [NM 441 669]. East of Grigadale, the Lighthouse­Achosnich road crosses a low peat-filled basin. As the road rises further east on to higher ground, however, a contact between the Grigadale granophyre and the older quartz­gabbro of Beinn Bhuidhe is exposed just a few metres north of the road. The contact can be traced for a short distance and appears to run east-west. The granophyre is fine­grained at the contact, whereas the gabbro is coarse­grained. The gabbro is also cut by a series of granophyre veins which range from 1 cm to 5 cm or so in width. Most of these veins run parallel to the contact and have direct cross connections with the main granophyre. Locality 13 [NM 442 668]. Follow the edge of the ridge of high ground to the south to some crags which lie about 150 m south-east of the road. Here the granophyre has several well-exposed contacts with the older gabbro of Lochan an Aodainn. The contacts are sharp and nearly vertical and the granophyre has developed a fine-grained chilled margin. Acid veins in the gabbro are numerous and increase in abundance towards the granophyre from which they originate. These veins vary between about 2 cm and 8 cm in thickness. Locality 14 [NM 443 668]. On the higher slopes of the ridge of ground, a tongue of granophyre cuts the Lochan an Aodainn gabbro, and masses of felsitic rock occur within the gabbro. The northern area of felsite is cut by a porphyritic cone-sheet of the inner suite of Centre 2. The felsites are probably associated with the granophyre. Locality 15 [NM 444 658]. Continue south along the ridge of high ground to the Allt Garbh-dhalach. Cross this stream and follow its west bank upstream until an important tributary enters from the south. Thence follow the west bank of the tributary for about 250 m upstream before heading west for a further 100 m to a series of outcrops which lie to the south of an extensive area of peat. Coarse­grained granophyre is found there in sharp contact with the quartz-gabbro of Garbh-dhail, which is chilled against the granophyre. This quartz-gabbro is therefore a member of the younger intrusive phase. Locality 16 [NM 440 662]. Return along the west bank of the Allt Garbh-dhalach to the ridge of high ground which had been followed south from the Ughthouse road, and continue along this ridge to the south-west for about 250 m. A sharp junction can be observed at this point on a flat rock surface between the granophyre and the quartz-gabbro of Garbh-dhail. A marginal, fine-grained facies of quartz­gabbro is in contact with fine-grained granophyre, but a metre or so away from the contact the granophyre is medium-grained and contains basic inclusions. 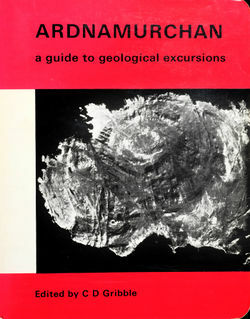 This suggests that the granophyre is younger than the quartz­gabbro, which must be a member of the older intrusive phase. Locality 17 [NM 439 661]. About 150 m further south-west, the characteristic rusty-brown, ice-rounded masses of the Beinn nan Ord eucrite are reached. These exposures are part of an easterly projection of eucrite which cuts across the quartz-gabbro of Garbh-dhail. The eucrite is allivalitic in character and contains small, rounded masses of coarsely ophitic augite-rich eucrite which may be cognate xenoliths. Locality 18 [NM 438 663]. Keeping to the higher ground, follow the east bank of the Allt Grigadale for about 250 m to the north, where large masses of gabbro occur as isolated exposures within a general area of granophyre. Although separated from each other by peat, they are probably parts of one large gabbro xenolith. The westernmost area of gabbro is profusely invaded by granophyre veins. The road to Achosnich is best reached by returning east along the high ground, and thence down the west bank of the Allt Garbh-dhalach to a wooden bridge which lies a short distance south of the road. This page was last modified on 14 December 2015, at 00:34.